How Many Anti-Malware Apps Do You Need? When your computer becomes infected with “something,” you quickly learn that there are myriad applications that may identify and eliminate the threat – or may not. No single anti-malware application cures every ill, just as no one antibiotic is a panacea against all diseases. Malware comes in as many species as biological bacteria and virii. Some varieties specialize in exploiting vulnerabilities in browsers, others in instant-messaging apps, still others in operating systems, and so on. Malware authors are constantly improving their wares in a never-ending arms race against authors of anti-malware apps. There is no One and Final defense against malware. Major malware apps like Symantec’s Norton 360 antivirus/antispyware program are criticized in some quarters for trying to do too much and doing everything mediocrely. A single program that tries to guard every door also tends to consume lots of system resources even when defense is not needed. Many computer users prefer smaller, lighter weight apps that defend against particular classes of malware peculiar to a given user’s computing habits. If you don’t use Internet Explorer, you don’t need protection against exploits of its vulnerabilities. These discriminating users build up toolkits of specialized anti-malware apps that exactly fit their needs. It is quite a chore to track down multiple anti-malware apps and keep them up to date. These apps are updated frequently with new algorithms and virus definition files. Fortunately, there is one app that takes most of the devil out of these details. Anti-Malware Toolkit is a totally free application that downloads many of the most popular anti-malware apps, threat definition files, and system utilities that can help diagnose and correct problems caused by malware. 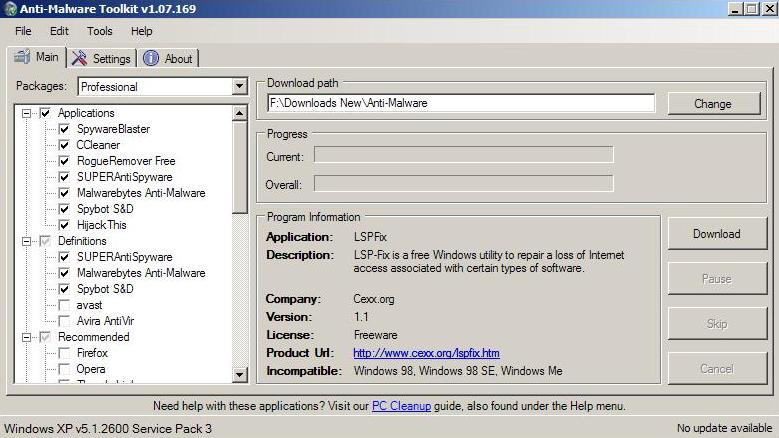 The Toolkit simplifies the process of collecting and installing anti-malware apps, and keeping them up to date. It can also introduce the user to anti-malware apps that were previously unknown. A total of 32 applications are available through a single download interface. Each application is briefly described in the Toolkit’s interface so the user has some idea whether it fits his particular needs. Ask a woodworker how many tools he needs and you will get an indeterminate answer. A penknife is enough for whittling, but when you need a left- or right-handed frammistat you need it badly and right now. The Anti-Malware Toolkit puts an extensive collection of the most versatile tools at your fingertips. David Hakala has written technology tutorials since 1988, in addition to tech journalism, profitable content, documentation, and marketing collateral.